Share Outlook Contacts. Send Contacts from Outlook and access them on a smartphone or tablet. Free tool to share Outlook Contacts. Share an unlimited amount of Microsoft Outlook Contacts with Free vCard Wizard Contacts Converter. Send Contacts as email attachments no matter if you need to share one or multiple contacts. Click “Send contacts”, choose the ones you want to share and they will be automatically added as attachments to a new email message. In just a couple of clicks you will be able to share an unlimited amount of contacts in a format that is recognized by almost any operating system or device including Google, iOS, Android and others. Download free version. No credit card. Share Contacts with people who do not have Microsoft Outlook. Share Outlook Contacts as business cards in vCard format with people who do not use Outlook. With vCard Wizard Contacts Converter you can share Contacts with Outlook, Google Contacts, iOS devices, WIndows, Android as well as with the most of operating systems and cellphones. Convert the contacts you want to share to vCard file and send them via email, instant message, bluetooth or use an external memory device. Share a vCard with your smartphone or other computer you are using and have the same contacts on different devices. If you trying to figure out how to share contact in Outlook 2010 without Exchange Server, vCard Wizard Contacts Converter is the tool you need. vCard Wizard Contacts Converter converter for Microsoft Outlook allows its users to send Outlook Contacts as email attachments in few clicks. 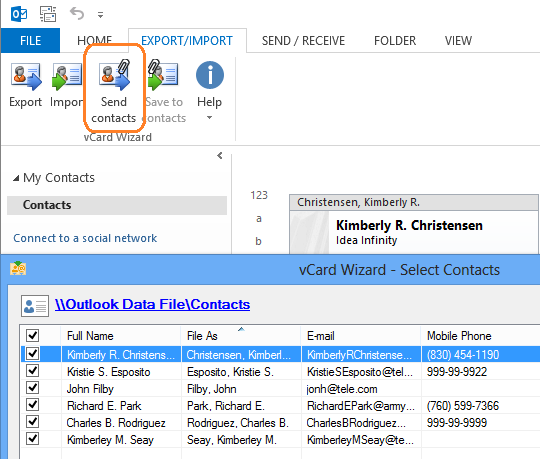 “Send contacts” feature allows vCard Wizard Contacts Converter users choose whether they want to send single or multiple contacts, or even the whole Contacts folder in vCard format. 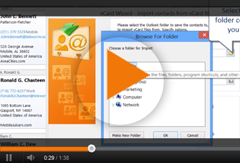 With vCard Wizard Contacts Converter Outlook contacts will be converted to vCard files and attached to Outlook email message automatically. vCard Wizard Contacts Converter Pro Edition allows you to send multiple contacts as one file. Send contacts to iPhone, BlackBerry or Windows Phone, the file can be opened in Google Contacts and with most of the cell phones as well. In just few steps contacts can be sent and accessed in almost any device with this easy to use Microsoft Outlook add-in. Get vCard Wizard Contacts Converter and send contacts via bluetooth to other devices - no internet connection needed.